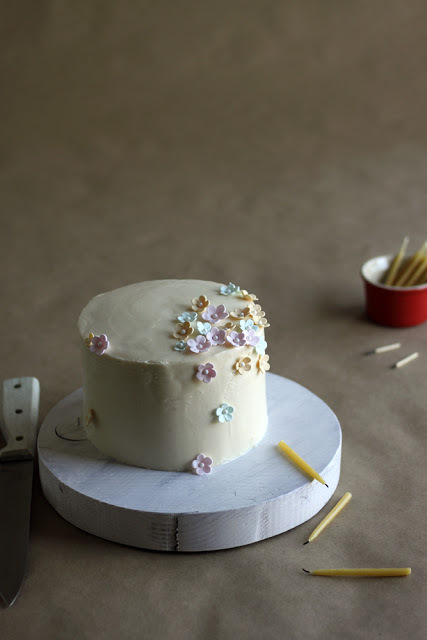 Almond Cherry White Chocolate Cake — always with butter. My first time with gumpaste! I convinced my lovely co-worker to walk me through my first time. Well, I didn't really have to convince her, she is always willing to teach me anything I don't know how to do. So I needed decided on what to make, something simple & classic without looking cheesy. I remembered the movie 'Run Fat Boy Run' and the wedding cake they had at the beginning with the little daisies scattered on it. It was probably only in the movie for a few seconds, if that. But it made an impression. I normally don't like many wedding cakes because they just go so over the top and look tacky. 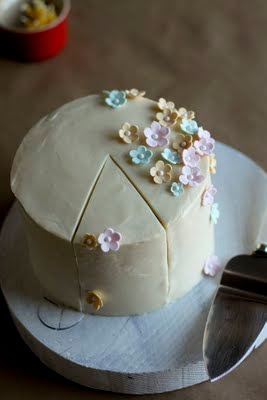 These little flowers on a minimal white cake was amazing to me. So with the opportunity to work with gumpaste, I just had to try to make these little flowers. And I'm in love with them! They were so simple to make, it reminded me of being in art class when I was little. Once the gumpaste is all made, you just have to roll it out, cut out the shape, form the shape then just let them dry. Just get one of those gumpaste mix cans and watch some YouTube videos, the best way to learn for free. It is a lot easier to see someone do it on the screen rather than just reading the instructions on the can and trying to understand exactly what the manufacturers mean. This cake is the white version of the Chocolate Blackberry Cake I made a while back. So I just changed up the flavorings and fruits and viola! a new cake. Almond and cherry, one of the ultimate combinations for me. It just goes perfect together and I don't know why, it's the tastes that blend together so well but also the smells. When I was young I remember using a cherry-almond lotion and thinking it smelled like heaven. I would find any excuse to use it, I just wanted that scent around me at all times. Hand-dipped all natural beeswax birthday candles. I wish I could say I made them myself, one day when I have the time, but no I got them shipped to me in a little brown box from some website. They make me never want to go back to the white striped candles that come in that little yellow box from the grocery store. bake for around 30 minutes. Cool completely. in sugar & beat until smooth. 4 layers. Fill with cherry buttercream. Frost outside with white chocolate cream.